This "petition for a Petition" is asking union bosses to allow their members to discuss a Parliamentary Petition calling for a whistleblower hotline for NHS staff. It is addressed to Unite Scotland’s Regional Secretary, to Unison Scotland’s Health Committee Convener, to the Royal College of Nursing (RCN) Scotland Associate Director and the Chair of the British Medical Association (BMA) Scotland. Please sign if you want to see the NHS a safer place. Anyone can sign, no matter whether you are employed or unemployed or retired, or even if you live outside Scotland. For it is in everyone’s interests who might ever use Scotland’s health facilities to see this petition for a Petition succeed. Why sign? Health workers in Scotland are being blocked by unions from debating whether to support a Parliamentary Petition calling for a whistleblower hotline. It would allow NHS staff to report mismanagement, bullying, perceived negligence, malpractice or ill treatment of a patient by a member of staff. The Petition PE1605 is shortly to go before MSPs and union support is crucial to seeing it implemented. But all four big health sector unions either won't support (or won't allow their members to discuss) the Petition, which calls upon the Scottish Government to establish an independent national whistleblower hotline for NHS staff to replace the current helpline. It would differ in that it would investigate reports about mismanagement, bullying and malpractice, often without recourse to NHS managers. The reason why the unions oppose the measure is because they say they are tied into partnership arrangements with NHS Boards and will do nothing that might undermine that. But it is clear that they have not even discussed the scheme with NHS Management; they have rather instinctively chosen to side with what they think managers will say. Whistleblower reports are taken by the Council’s Governance Risk And Best Value (GRBV) Committee and have led to numerous improvements at the Council. The Petition to the Scottish Parliament has been signed by politicians from right across the spectrum. Supporters include MSPs Kezia Dugdale (Scottish Labour Leader); Jeremy Balfour (Conservative Shadow Minister for Childcare & Early Years- who also helms Edinburgh’s GRBV Committee) and Green MSPs Alison Johnstone and Andy Wightman. It is supported by The UK Patients Association, by Action for a Safe and Accountable People’s NHS (ASAPNHS), the Scotland Patients Association, the NHS Lothian Branch of Unite and Accountability Scotland. So the only agencies refusing to support the scheme are the unions and staff associations. They say that the Scottish Government’s scheme of Sept 2015 to install regional Whistleblowing Champions in every Health Board should be allowed time to render results. But the government itself states that the Champions would have no role to play in investigating staff concerns; their role is to provide assurance to the Boards that whistleblowers are not being victimised. Indeed, Boards state the Champions have no staff-facing role, so they are unlikely to benefit whistleblowers directly. As each Board makes clear: "The Whistleblowing Champion does not form any part of the whistleblowing policy, is not a point of contact for staff; and does not become involved in the investigation of cases.The Champion is there to ensure that staff members who report concerns are being treated and supported appropriately and not victimised." Yet if a staff member is being victimised, the champion will never know, for Boards refuse to divulge details of who the champions are, so there is no way they can "champion" anybody or anything. The Petition makes clear there could be an effective role for the champions; it could be the responsibility of each Board’s Whistleblowing Champion to liaise with the hotline provider to protect whistleblowers from retribution, to ensure their concerns were being considered and to ensure an annual whistleblowing report was compiled. Pete Gregson of Kids not Suits lodged the Parliamentary Petition and is a Unison union activist: “I can’t understand why unions would not support a measure that would benefit their members and the health of the nation. It feels as if they are content with the useless helpline and see any change as a problem. Why can't they apply the NHS values of openness and transparency to themselves? Why aren't they member-led? Where is workplace democracy in this? I started trying in February to get Lothian NHS Branch to discuss this at our monthly meetings but have been blocked at every turn. 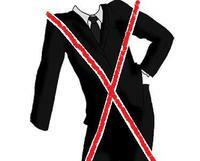 The refusal to discuss or support the Parliamentary Petition runs all the way up from the Branch Exec to Head Office. Because there is no decent system in place, staff resign or get sacked over disputes and going to an Employment Tribunal can mean waiting years for justice, as Blueprint found in their recent Whistleblowing Report." 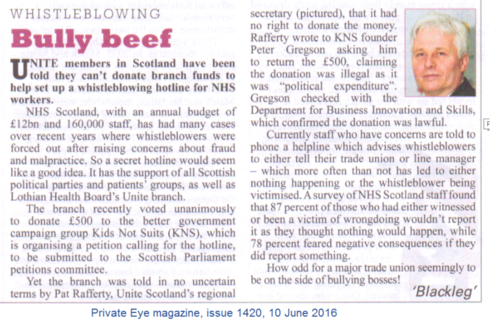 The failures of the current system with Whistleblower champions were highlighted when the Queen’s surgeon was bullied out of his job in April - Prof Krukowski has now left Grampian Health Board; he had been suspended for pointing out to ARI bosses that operations were being carried out unnecessarily (see the P&J of 23rd April ) His colleague Dr Wendy Craig got the same treatment. Currently staff who have concerns are told to use the helpline to tell their trade union or manager – which more often than not has led to either nothing happening or the whistleblower being victimised. The NHS Scotland staff survey found only 57 per cent of staff thought it was safe to speak up and challenge the way things were done if they had concerns about quality, negligence or wrongdoing. The Petition is shortly to go before MSPs and union support is crucial to parliamentary approval. Please help make Scotland’s health service safer by signing this one.